If you have spent much time around these parts, you would know that I am a popcorn aficionado, a gourmand of the cob if you will. I have looked down with abject scorn at those who would sink to eating store bought, microwave packing material rather than the delightful, stovetop butter-infused goodness that is better suited to my well-honed palate. I have proudly stated many times that microwave popcorn hasn't touched my lips in over ten years, a record I have held on to staunchly, even in the face of terrible hunger with crappy vending machine popcorn only three-quarters away. I finally caved and had microwave popcorn last night. But before you wag your finger in contempt, let me tell you, it was divine. 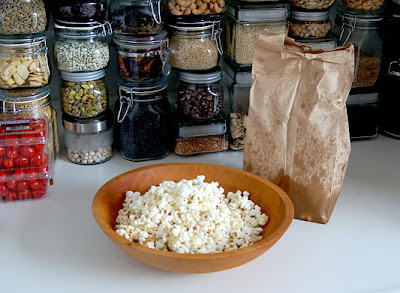 I found a recipe for homemade microwave popcorn. I generally don't share recipes here because a)this is not a food blog b)most of my friends and readers couldn't cook their way out of a paper bag. But alas, this is cooking with a paper bag so even the most cooking challenged among you can pull this off. This is a great one for the kids to make too, easy peasy. Oh, and it tastes good, real good and you know what's in it so less this. Tonight, I will try my hand at a variation using raw sugar to make kettle corn, I'll report back. Alton Brown, you are my hero. Toss the popcorn with the olive oil & salt in the paper bag. Fold the top of the bag over and staple the bag twice to close. Place the bag in the microwave and microwave on high for 2 minutes to 3 minutes, or until there are about 5 seconds between pops. NOTE: Popcorn salt is a super-fine salt that is designed especially for sticking to food such as popcorn. It has the taste of regular table salt, but its granules are much finer.